Bi-chrome brick exterior was probably later rendered after 1887. Corner door and adjoining windows altered in recent years. Is seeing believing? Although the date on the pediment seems like a good piece of evidence, sources such as licensing records, rate books, and Sands and McDougall directories suggest it was not yet built in 1866. An 1880s photo of Langridge Street shows the side wall in brick. If the whole building was rendered after this time, the date may have been added then and relied on inaccurate data. The first publican was Elijah Horwood who remained as publican from 1869 until 1884. 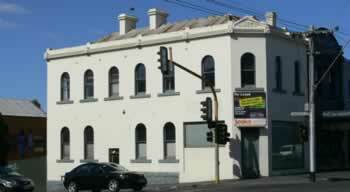 From 1930 until the 1970s the building housed the office of G.D. Langridge & Son, estate agents. In recent years the ground floor has been further altered to suit office/shop uses.